The largest of the Dodecanese, Rhodes (or Rodos), the capital of the Dodecanese Islands, has become an important regional centre, thanks to its location, climate, history and natural attractions. The island’s terrain is in large part fertile with a great variety of vegetation; its highest mountain is Atavyros (1,215 m. asl) in the southwest. The capital, also called Rhodes, occupies the northernmost tip of the island. There are actually three cities on this site :The modern town has an cosmopolitan character, many late 20th century buildings and a high number of hotels. The ancient town, which was founded in 408 B.C. according to plans by Hippodamos of Milesios (the first town planner), started from Monte Smith hill where the acropolis stood and extended as far as what is now the mediaeval city. All that is left of it today is the ruins of the temples of Zeus, Athena Poliados and Apollo, the Stadium, Gymnasium and the Theatre, which has been restored. The mediaeval city is still surrounded by the high walls erected by the Knights. It is divided by an inner wall into two unequal parts, the smaller Collachio and the larger Burgo or Hora. Lindos offers the contrast between the brilliant white houses and winding lanes of the more recent village, built around two crescent beaches, and the ancient Acropolis, towering above it from its austere pinnacle, one of the most stunning views in Greece. The temple of Athena Lindia (4 th cent. B.C.) coming gradually into view as you ascend the stairs is a sight never to be forgotten. The island abounds in lovely and interesting places to visit, such as the Valley of the Butterflies, the village of Trianda near the site of ancient Ialyssos on the top of Filerimos hill, where the 15 th century monastery of the same also stands, along with the ruined temples of Athena and Zeus Poliea in the ancient acropolis, Kamiros and the ruins of the Dorian city, Kalithea with its thermal baths, Koskinou, Afandou, Faliraki and Rodini. Finally, there are splendid beaches all over the island, some of which are equipped with facilities for bathers and equipment for water sports. 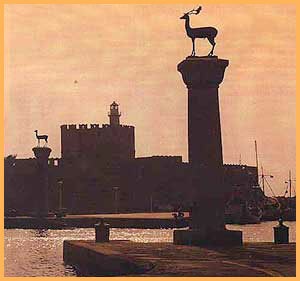 The entrance of Rhodes' harbour. Take a look on the history and more photographs of the island Rhodes.